There seem to be certain aspects of modeling where perfection remains ever-elusive. The perfect paint. The perfect putty. The perfect method for masking canopies. And…specific to aircraft…the perfect seatbelts. There’s thin strips of tape with wire buckles. There’s lead foil. 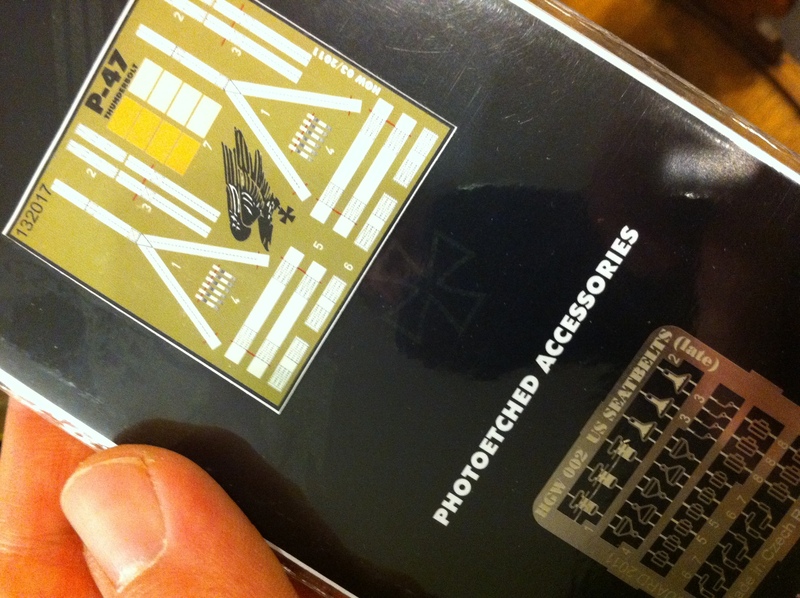 There’s photo-etch, which can be excellent, especially with Eduard-style color photo-etch. But photo-etch is stiff and difficult to pose realistically. About a month ago, I read about these new seatbelts from HGW. They use photo-etch buckles and other hardware, but the belts themselves are made out of a “microtextile” that behaves much more like the real thing. Since they cost roughly the same as Eduard’s PE belts, I decided to grab a few to give them a try. Stay tuned for a review, but so far, these things look very promising. NOTE: These pictures were taken with an iPhone under less-than-optimal conditions and a lot of the fine detail is wiped out, particularly on the belts. They look awesome in person, easily on par with Eduard’s best, with stitch lines and the like. So, what do you think? Do these look awesome or what? i’m not sure you can get much more realistic than that! who distributes these? very cool. I’m sure Doog’s may have more info. 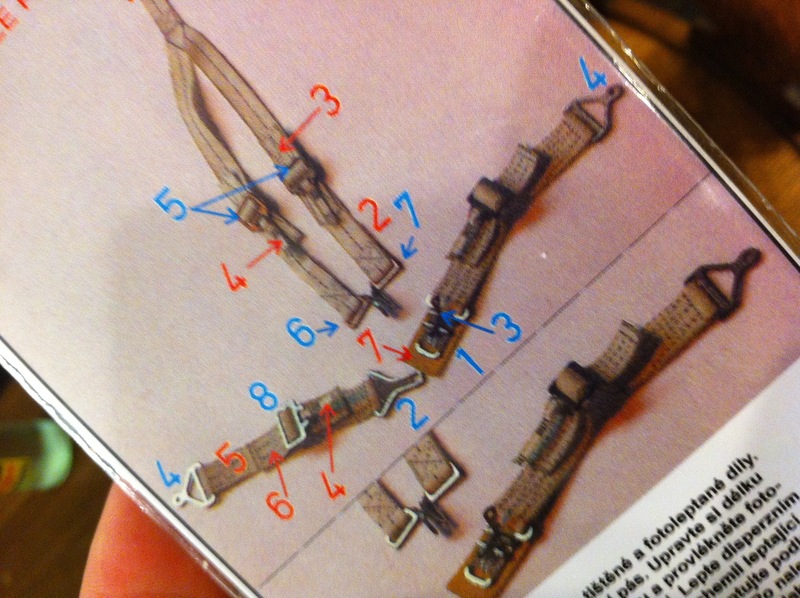 Constructing these belts is a job in itself – can you provide quick tutorial on your recipe for success? 1 – Remove the belts from the, uh, fret? The newer ones are laser cut so it’s just a few snips and you’re good to go. 2 – Ball them up, smash them up, generally do whatever you can to get them wrinkled and battered-looking. 3 – DO NOT TRY TO MULTI-THREAD. Trying to get two or more belts through one buckle is a sucker’s game. Thread the topmost visible belt, then trim the ones behind it and just glue them to the back of the belt material. RB Productions belts can be fully threaded because they’re made of a stouter material, but the HGW/Eduard belts? Shortcuts are your friend! 5 – For gluing them down, I’ve found it best to start at the attach points and work in sections. Generally, I use CA to secure buckles to the seat/bulkhead, and PVA glue for the belts themselves. I’ve used these a fair bit now, even got the multi-thread down pat. Nothing better than the Eduard or HGW releases. I’ve also found two part epoxy glue holds them down very nicely. They do look superb but are far from easy.,.. I have now tried three times to use them, each time a fail unable to thread them with their tight tolerancers, usually ending with p.e.pinging off into the ether along with much foul language. I expect I will try yet again one day…. 1/ they are ideal for those like me who are too cak-handed to thread the fabric and p.e. ones as they are fairly simple. 2/ they are pre-painted and the paint does not flake or peel unlike others. 3/ unlike the older p.e. sets they are easy to manipulate into position.